In Psalms 92:7, David says, “the wicked spring up like grass,” which is here today and gone tomorrow. Then, in verse 12, he says, “the righteous shall flourish like a palm tree.” He is making a contrast between the two. Grasses grow quickly, and die quickly. Expose grasses to extreme heat, and their leaves dry up, wither, and die. That’s the way the wicked flourish. They may flourish quickly, but their success will not last. It will all be consumed, either by things in this world, or the judgement of the next. Not so with the leaves of the palm tree. Even in the desert, in the valleys, or on the mountains, exposed to extreme weather conditions under which other plants cannot live, the leaves of these trees remain green. Their leaves do not dry up, change color, or fall down due to climatic changes around them. They live very long, hundreds of years, even up to a thousand years, and keep growing and bearing fruit over many years. 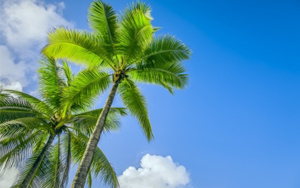 In fact, the palm tree is one of a few trees that bear more fruit the older it gets. In storms, they bend but they do not break. After the storm they straighten up again, and are actually stronger than they were before the storm. This is how the righteous flourish. Like the palm, they will continue to grow year after year, under all types of circumstances, reaching higher and higher in their faith, growing continually into the likeness of Christ, expressing more and more of his image. Like the palm tree, they will endure. The storms of life will not destroy them. They may bend under the weight, but they will not break, and after the storm they are still able to stand upright, walk straight, and keep growing. The heat will not cause them to dry up, nor the cold cause them to freeze up. They flourish under all kinds of conditions. And they will bear fruit, even in old age. Child of God, these are God’s promises to the righteous. And you are the righteous because Jesus made you righteous. So these are His promises to you. And if you believe, you will see each one of them fulfilled in your life. V12: reaffirms what V10 states. Because we’ve been strengthen and anointed for the season…therefore we’ve also been anointed to flourish despite the condition of the wheater. And because we thrive not in our own strength but HIS…: “MY GRACE IS SUFFICIENT FOR THEE:FOR MY STRENGHT IS MADE PERFECT IN WEAKNESS” 2Cor 12:9. GRACE blesses to flourish and the ANOINTING enables to endure. All glory goes to HIM.